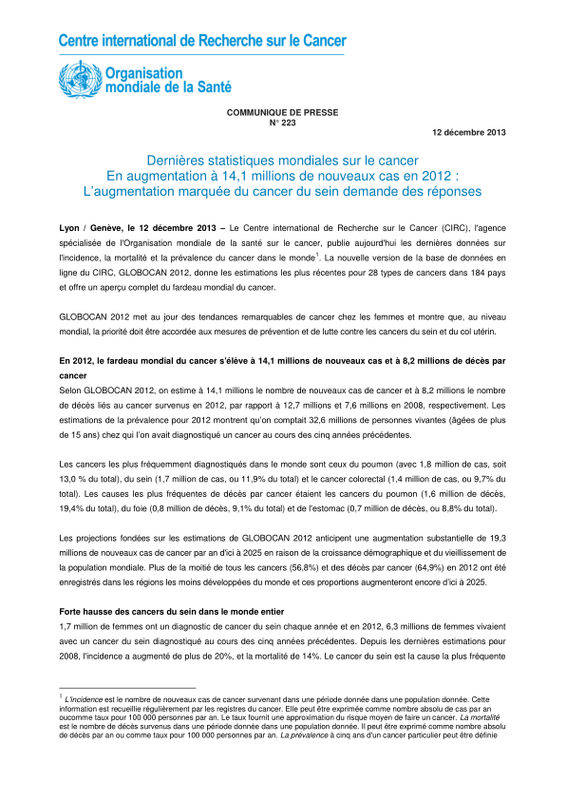 Lyon/Geneva, 12 December 2013 – The International Agency for Research on Cancer (IARC), the specialized cancer agency of the World Health Organization, today released the latest data on cancer incidence, mortality, and prevalence worldwide. 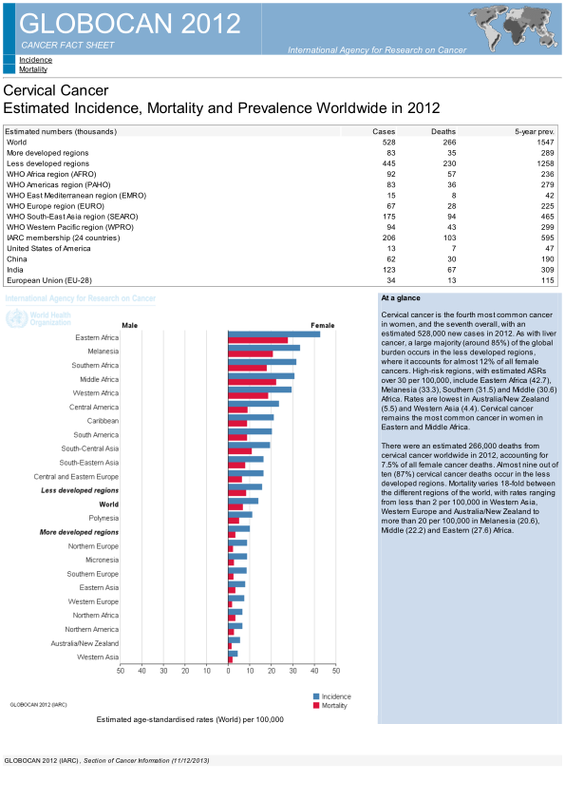 [i] The new version of IARC’s online database, GLOBOCAN 2012, provides the most recent estimates for 28 types of cancer in 184 countries worldwide and offers a comprehensive overview of the global cancer burden. GLOBOCAN 2012 reveals striking patterns of cancer in women and highlights that priority should be given to cancer prevention and control measures for breast and cervical cancers globally. According to GLOBOCAN 2012, an estimated 14.1 million new cancer cases and 8.2 million cancer-related deaths occurred in 2012, compared with 12.7 million and 7.6 million, respectively, in 2008. Prevalence estimates for 2012 show that there were 32.6 million people (over the age of 15 years) alive who had had a cancer diagnosed in the previous five years. The most commonly diagnosed cancers worldwide were those of the lung (1.8 million, 13.0% of the total), breast (1.7 million, 11.9%), and colorectum (1.4 million, 9.7%). The most common causes of cancer death were cancers of the lung (1.6 million, 19.4% of the total), liver (0.8 million, 9.1%), and stomach (0.7 million, 8.8%). Projections based on the GLOBOCAN 2012 estimates predict a substantive increase to 19.3 million new cancer cases per year by 2025, due to growth and ageing of the global population. More than half of all cancers (56.8%) and cancer deaths (64.9%) in 2012 occurred in less developed regions of the world, and these proportions will increase further by 2025. In 2012, 1.7 million women were diagnosed with breast cancer and there were 6.3 million women alive who had been diagnosed with breast cancer in the previous five years. Since the 2008 estimates, breast cancer incidence has increased by more than 20%, while mortality has increased by 14%. Breast cancer is also the most common cause of cancer death among women (522 000 deaths in 2012) and the most frequently diagnosed cancer among women in 140 of 184 countries worldwide. It now represents one in four of all cancers in women. “Breast cancer is also a leading cause of cancer death in the less developed countries of the world. This is partly because a shift in lifestyles is causing an increase in incidence, and partly because clinical advances to combat the disease are not reaching women living in these regions,” says Dr David Forman, Head of the IARC Section of Cancer Information, the group that compiles the global cancer data. Generally, worldwide trends show that in developing countries going through rapid societal and economic changes, the shift towards lifestyles typical of industrialized countries leads to a rising burden of cancers associated with reproductive, dietary, and hormonal risk factors. Incidence has been increasing in most regions of the world, but there are huge inequalities between rich and poor countries. Incidence rates remain highest in more developed regions, but mortality is relatively much higher in less developed countries due to a lack of early detection and access to treatment facilities. For example, in western Europe, breast cancer incidence has reached more than 90 new cases per 100 000 women annually, compared with 30 per 100 000 in eastern Africa. In contrast, breast cancer mortality rates in these two regions are almost identical, at about 15 per 100 000, which clearly points to a later diagnosis and much poorer survival in eastern Africa. With 528 000 new cases every year, cervical cancer is the fourth most common cancer affecting women worldwide, after breast, colorectal, and lung cancers; it is most notable in the lower-resource countries of sub-Saharan Africa. It is also the fourth most common cause of cancer death (266 000 deaths in 2012) in women worldwide. Almost 70% of the global burden falls in areas with lower levels of development, and more than one fifth of all new cases are diagnosed in India. In sub-Saharan Africa, 34.8 new cases of cervical cancer are diagnosed per 100 000 women annually, and 22.5 per 100 000 women die from the disease. These figures compare with 6.6 and 2.5 per 100 000 women, respectively, in North America. The drastic differences can be explained by lack of access to effective screening and to services that facilitate early detection and treatment. “These findings bring into sharp focus the need to implement the tools already available for cervical cancer, notably HPV vaccination combined with well-organized national programmes for screening and treatment,” stresses Dr Wild. The online GLOBOCAN 2012 resource at http://globocan.iarc.fr/ is easy to use and has facilities to produce maps and other graphics. 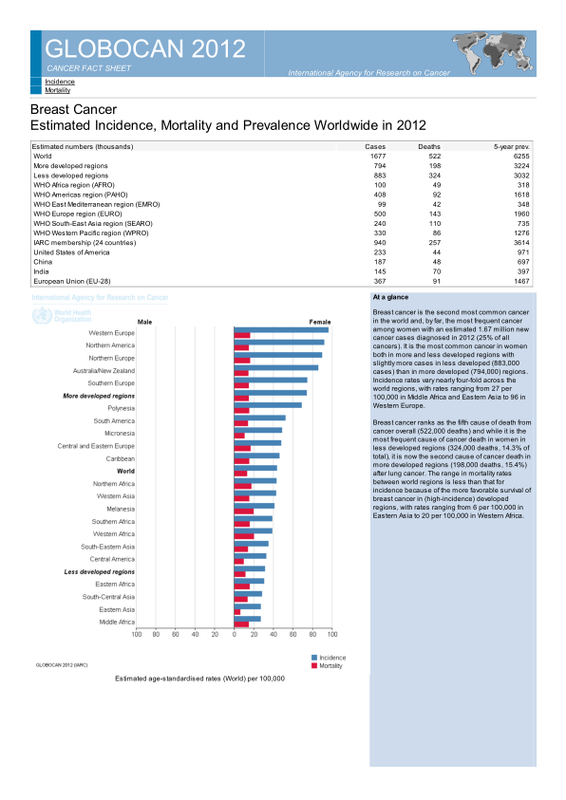 In addition, a series of fact sheets describe the overall cancer burden within specific areas or countries. GLOBOCAN 2012 also provides the user with facilities to predict the future cancer incidence and mortality burden over the next 20 years according to projected population ageing and population growth. These estimates are based on the most recent data available at IARC and on information publicly available on the World Wide Web. GLOBOCAN 2012 provides a global profile of cancer that has been developed using a number of methods that are dependent on the availability and the accuracy of the data. National sources are used where possible, with local data and statistical modelling used in their absence. Ferlay J, Soerjomataram I, Ervik M, Dikshit R, Eser S, Mathers C, Rebelo M, Parkin DM, Forman D, Bray, F (2013). 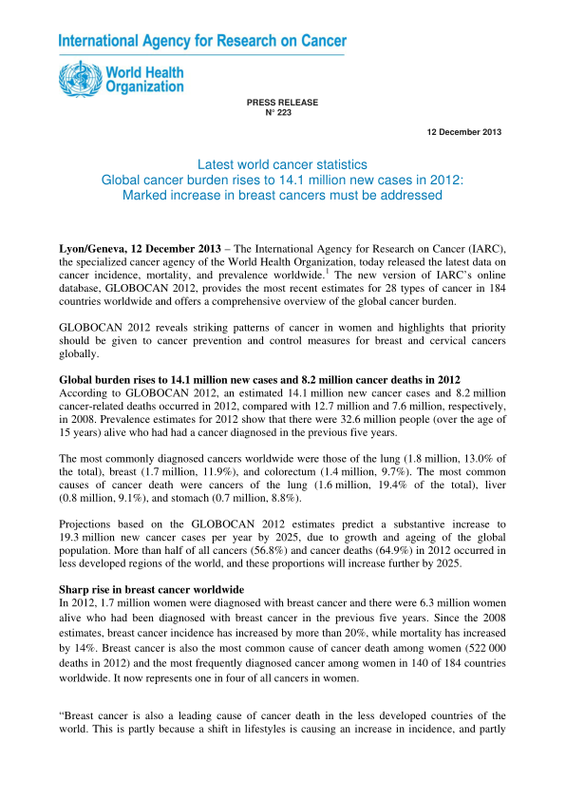 GLOBOCAN 2012 v1.0, Cancer Incidence and Mortality Worldwide: IARC CancerBase No. 11 [Internet]. Lyon, France: International Agency for Research on Cancer. Available from http://globocan.iarc.fr. The International Agency for Research on Cancer (IARC) is part of the World Health Organization. Its mission is to coordinate and conduct research on the causes of human cancer, the mechanisms of carcinogenesis, and to develop scientific strategies for cancer control. The Agency is involved in both epidemiological and laboratory research and disseminates scientific information through publications, meetings, courses, and fellowships. If you wish your name to be removed from our press release e-mailing list, please write to com@iarc.fr. [i] Incidence is the number of new cases arising in a given period in a specified population. This information is collected routinely by cancer registries. It can be expressed as an absolute number of cases per year or as a rate per 100 000 persons per year. The rate provides an approximation of the average risk of developing a cancer. Mortality is the number of deaths occurring in a given period in a specified population. It can be expressed as an absolute number of deaths per year or as a rate per 100, 000 persons per year. The five-year prevalence of a particular cancer can be defined as the number of persons in a defined population who have been diagnosed with that type of cancer in the previous five years and who are still alive at the end of a given year.